Today was the first Mother’s Support Day of 2016. 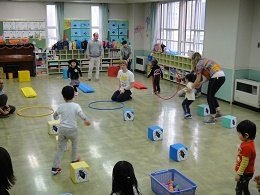 The children arrived and had lots of fun playing with the jump ropes, mats, balance bars and other toys. 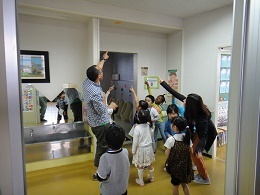 After exercise together it was time for today’s English Activity, making IYK Parks. Everyone received a small park but needed to help find the flowers around the school to get stickers to make their parks look more cute. 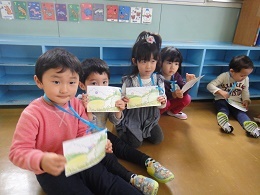 All of the children had lots of fun searching all around the Kindergarten trying to find flowers and using lots of great English; “I found a blue flower”, “Over there”, “It’s cute!” After all of the children had finished making their parks it was time to play a flower making game. We first got a ‘seed’ and ran around trying to avoid the beetles, next went through a hoop and over bridges before planting the seeds and giving them water to help them grow. After all of the fun in the morning everyone was hungry and soon finished their yummy lunch boxes before it was time to go home. All of the children worked well together to complete the challenges and had lots and lots of fun. Great job!